For this month's Blog hop, I was paired with Chef Mireille. She is a versatile cook who has tried her hands in various cuisines. Whenever I visit her blog, I always get to learn something new. She always shares a lot of information in each of her post. She has a lot of interesting recipes in various cuisines. I have a list of items I would like to try from her blog. 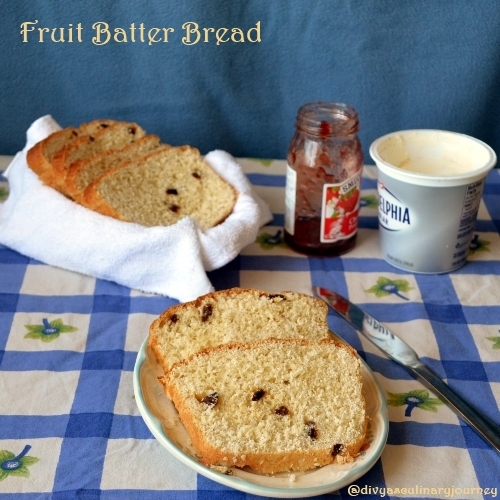 For this blog hop, I tried her Fruit Batter bread. I have just halved the recipe to fit my loaf pan and as I was running short of dry fruits, I used only raisins. The bread was very easy to make and it came out awesome. For a bread lover like me, what a delight to eat the bread baked on my own! But the only change I would do next time is adding some more of other dry fruits as per the original recipe, for the fruity effect. How it is made ? In a large bowl, mix half(1 1/4 cup) of flour, sugar, salt, yeast mix well and set aside. In a sauce pan, add water, milk and butter and warm it, just till the butter melts. Add egg and this mixture to the flour mixture and little by little add the rest of the flour and keep kneading. Mix the all dry fruits into the batter. The batter will be sticky. Prepare a loaf by greasing it and pour the batter into the loaf pan. Cover it and let it rise for an hour or till its doubled in size. Pre-heat the oven to 350 F and bake for 30- 35 minutes until the bread is golden brown and sounds hollow when tapped. Indeed a yummy bread.I always wonder how the batter breads turn this delicious..You baked it perfect Divya..Cheers! Irresistible slices, loving this fruit batter bread..Cant wait to try soon. 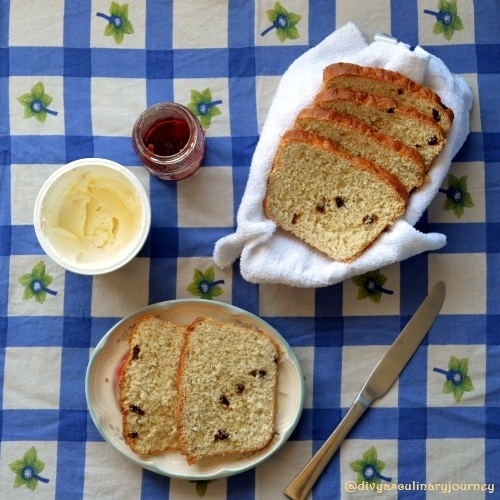 How nice to make your own fruit bread! Lovely bread and inviting clicks.. I am sure it must have tasted great, with the perfect texture and color. Lovely bread..definitely a kid's delight ! i like this!really nice....the bread looks great. Looks so delicious, yummy bake..